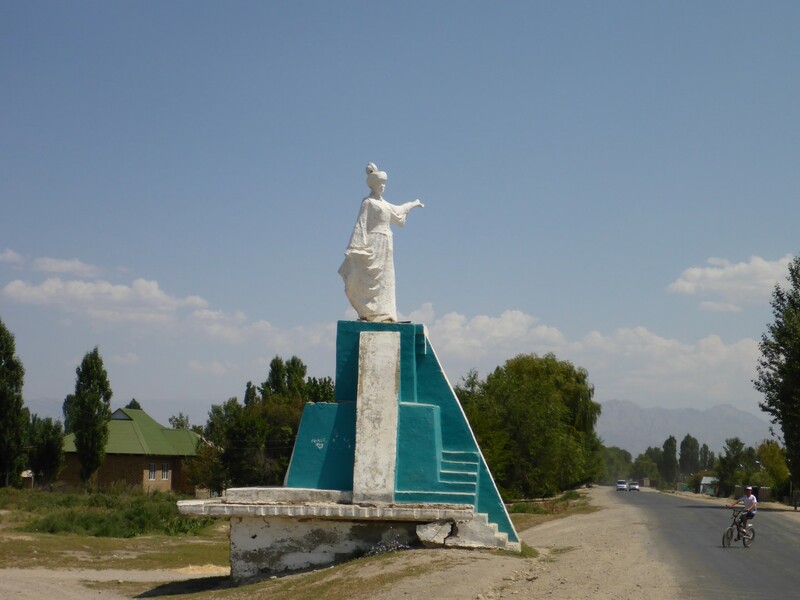 Talsa, Kyrgyzstan. 3rd August 2014. I was sad to leave Kyrgyzstan as it’s a country with stunning scenery and friendly people. 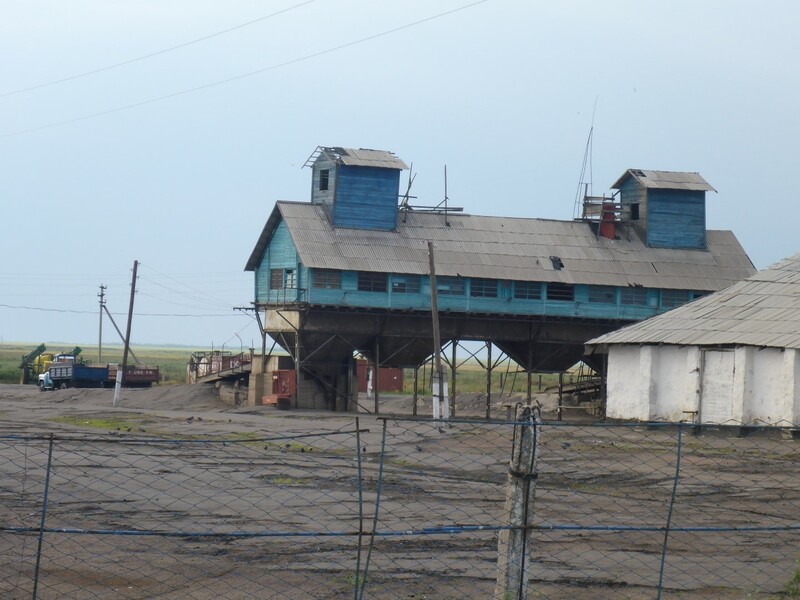 The way of life is similar to much of Kazakhstan but there is clearly less money around. Most prices are cheaper, except for petrol, and the way of life seems to have modernised at a slower pace. The area I was in clearly relied on the tourist trade for much of its income. No surprise as it has much to offer in terms of natural beauty and would provide a cheap holiday for people from further north, such as the Russians I met in Torsor. The ride to the border was easy enough, the border post being, yet again, at the end of a dirt road. There must be a tacit rule about these places – we don’t want you to leave so we wont make it easy. For reasons I didn’t quite understand the Kyrgic customs guard wanted to look in my bags. Did he think I was stealing their rocks or something? Anyway, both borders were straightforward and I was clear in just over an hour. 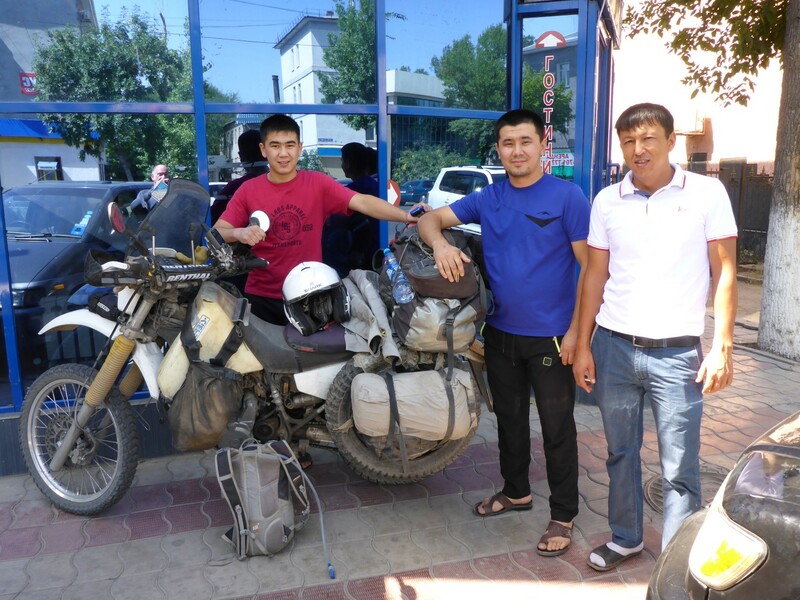 When I was through I stopped to sort out my gear and an English speaking Kazakh stopped for a chat. He invited me to stay with him but I declined as I’d booked a room at a Hotel in Shymkent and, at 4pm, it was a bit early. But what typical kindness. 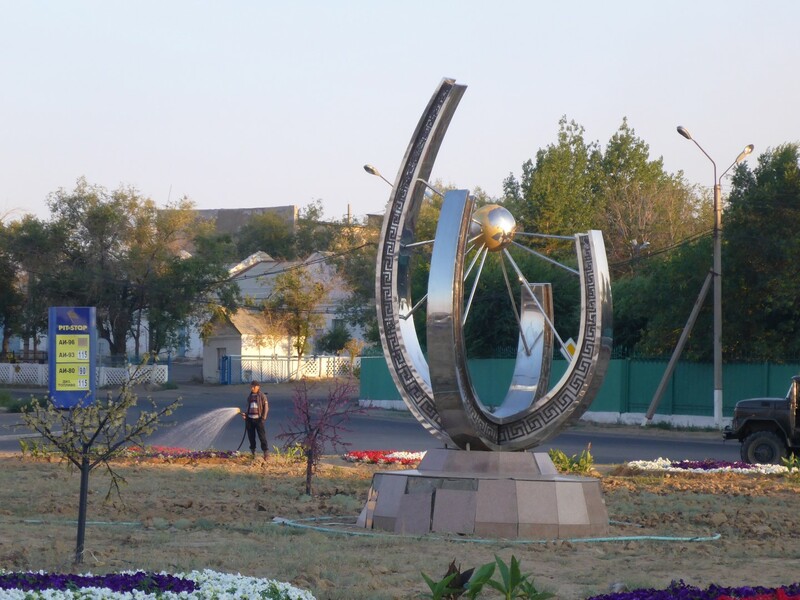 I enjoyed another example of that when I was passing through the city of Taraz. A guy in a car said ‘Hello’ to me at a set of traffic lights and I asked him for the road to Shymkent. He said ‘Follow me’ and led me through the city to the road I needed. I think that without him I might still be there now. Go West young man, so I did. The road out of Taraz was a nice, new dual carriageway for about 80kms then, as it crossed into a different Oblast (region) the dreamy condition turned literally to dust. An absolute horror of a road in the worst Kazakh style with an appalling surface and constant roadworks. 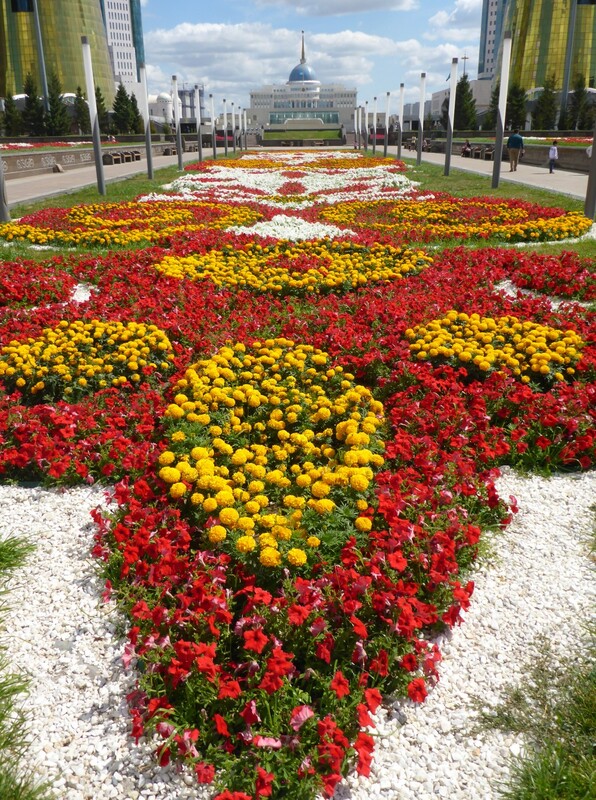 When I got to Shymkent I got off the bike and kissed the ground. Metaphorically anyway. With the aid of the compass on my GPS and a few directions from some cab drivers I found the hotel I’d booked and started to unwind a bit. I found a local Pizza restaurant, ordered a takeaway and unwound a bit more. It had been a long, very hot, very dusty day. I stayed there two days while I tried to organise a replacement SIM card and talked to base Camp about sending out my replacement credit cards. I also got some blog writing done. Hera had told me about a useful free mapping App that I could download to my phone so I spent some time doing that too. That kind of activity is new to me and there was no convenient teenager to do it for me. But I persevered and when it was finally done I found that my phone didn’t have enough memory to operate it. I think I might be in the market for a better phone. Even up loading the blog was proving to be a challenge too far. Some people have bad hair days, something that hasn’t troubled me for a few years now. Instead I just have bad data days. I gave up and had an early night. 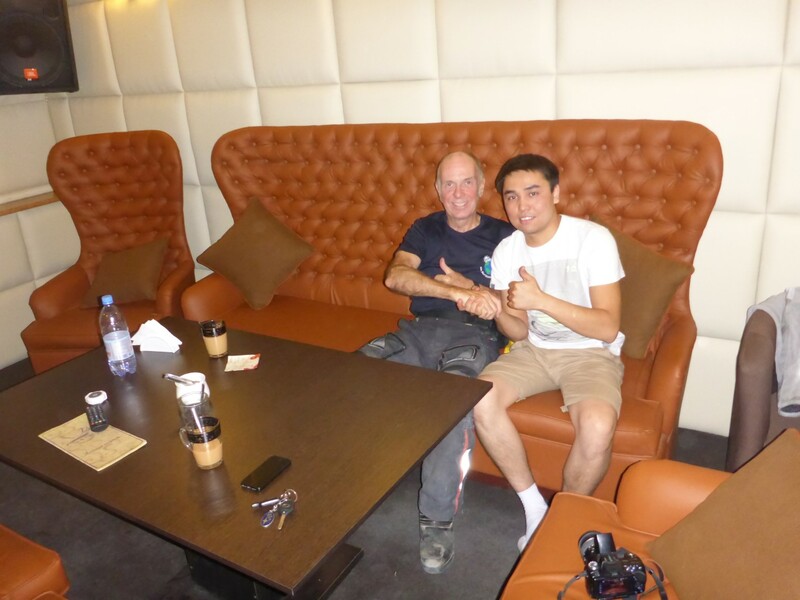 Owner of the hotel in Shymkent, and friend. Blog finally sorted and up loaded, I packed my gear and went to leave. While I was loading the bike a guy was chatting to me in English. It turned out he was the hotel owner and he very usefully drew me a map of how to get out of the city. In return I told him how good I thought his hotel was and how nice his staff were. Which was mostly true. When I stopped for fuel on the way out of the city the attendant noticed the two stickers that the cab driver had insisted on putting on my bike after he’d given me directions. I figured they weren’t going to get him much business where I was going so I took them off. The map took me on to a shiny new dual carriageway which I expected to disappear, in typical Kazakh style, once I’d left town. But no, it carried on for many kilometres until I reached the town of Shyek, where I stopped at a café. I asked about a hotel in the town and a guy in there drew me a map to a truckers’ hotel not far down the road. I couldn’t find it. I scouted around but no luck. While I was stopped at the side of the road a guy in a car stopped and I asked him about the hotel. He said to follow him and led me to his house. Why was I not surprised? Those friendly and generous Kazakhs saved the day once again. 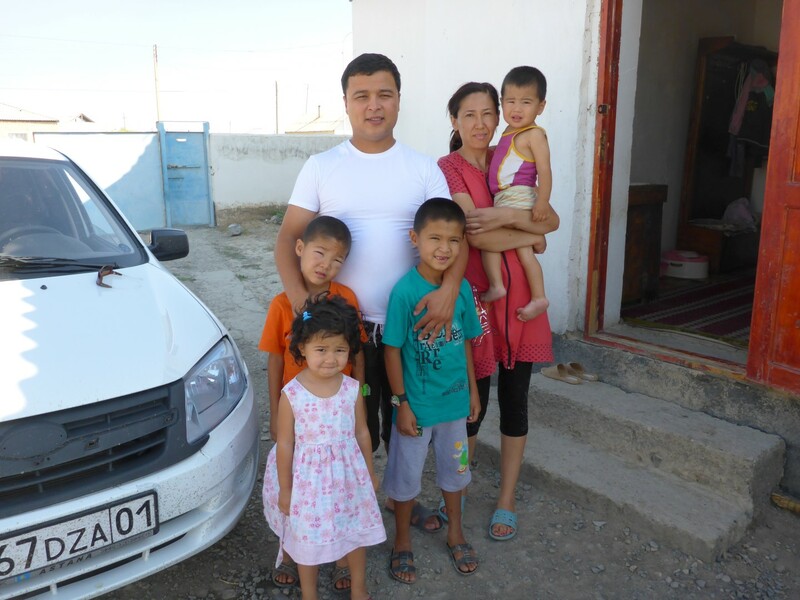 He is Rustem and he and his wife Hizat have four kids between the ages of one and eight. He is thirty years old and his father is a famous producer of some kind. Their house is quite large and surrounds a courtyard. It is furnished in traditional style, with cushions and low tables, and also has the traditional outside toilet, albeit tidier and cleaner than many I’d seen. I’ve mentioned before the lack of running water to most houses and theirs was no different. Rustem took me to a sauna where we met his brother, all gold teeth and offers of getting me a woman. I enjoyed the sauna and shower but politely declined everything else. I did ‘enjoy’ a demonstration of Kazakh style driving when we all crammed into his car, Rustem, Hizet, me and one of his friends along with his friend’s son and two of Rustem’s kids. He’s a ‘go for it’ driver and he went for it, in fine style as we headed out to look at the local river, of which he seemed very proud, and then to his mother in law’s house to pick up his other two kids. I don’t know how we all fitted in to this ordinary saloon car. I was in the front and just sat back and enjoyed the ride although I was pleased when we arrived back intact. The rest of the evening was spent eating and chatting, with the aid of my dictionary. I learned that his background is Saudi Arabian rather than Kazakh and I think he came here with his father. He showed me the words for farmer, land and vacation, so I think he owns some holiday homes somewhere, possibly in Astana, the capital. It’s difficult to be sure. He’s clearly a bit of a lad and seems to know all the local police. At some point there had been a fire somewhere as two of his kids have scars from burns on them, his son’s being a bit more obvious than his daughter’s. She’s a very pretty little girl with curly black hair and a very impish smile. One of Rustem’s kids. Cute. table and they insisted on paying for my food too. All I could do in return was to describe my journey to them and, as is often the case, they expressed amazement I was on my own and also at my age. I’d had this reaction many times and it puzzles me. Does life finish at fifty in these parts? Is it a cultural issue, where leaving home and hearth to travel to far flung places just isn’t done? It certainly isn’t a lack of courage as life in these countries can be very harsh and difficult. It remains a puzzle. Roadide statue. I don’t know what it is but I liked it. Although this road had started well I had come to a stretch of dirt road, announced by signs stating for how long it would last. I was now in the middle of the second such stretch, 38kms long with about 10kms left to cover if the sign was to be believed. Once again the Kazakh road system decided to have a laugh at my expense as it was actually another 100kms of broken, pot holed road surface before I was to see the beautiful asphalt once more. And there was a price to pay too. I’d had to empty my spare can in to the tank and a while later I knew I wasn’t going to get to the next town before running out. Locals understand the need for fuel and there’s always someone who has some for sale out of a drum, ‘round the back’. I found such a place, a dingy looking café, where I bought five litres at a very inflated price. It was then that I noticed that my spare can had fallen off the back, it’s retaining strap having somehow burnt through on the exhaust. I knew I was going to need that can again so I went back to find it, feeling sure it wouldn’t be too far away. I was right, and was lucky to be so. When I re-attached the can to the bike I realised that my very expensive and very necessary riding jacket had also fallen off. If I had decided to abandon the fuel can I would have lost the jacket too. I found it not far away, thankful I was on a road that wasn’t too busy. How to make a roundabout more interesting. 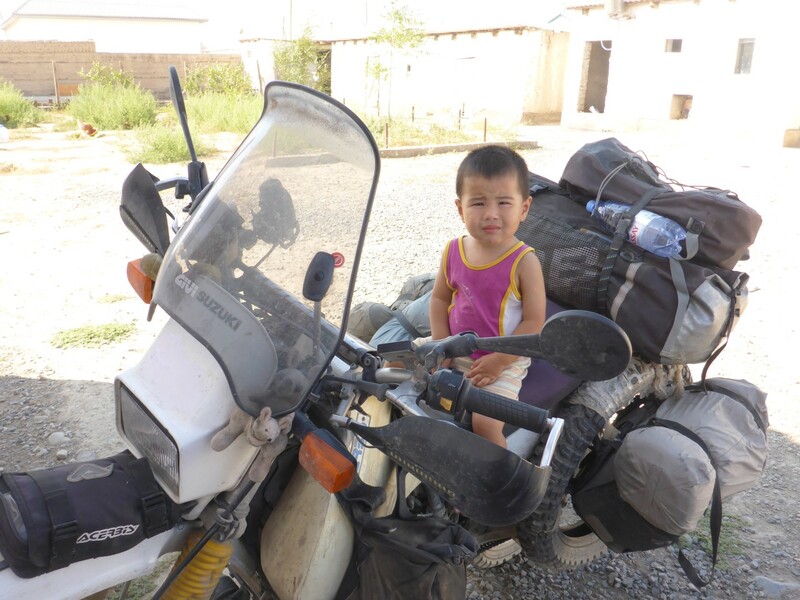 Things continued to improve as the tarmac returned and I reached my target town of Jezkazghan. They improved still further when a helpful guy stopped to assist me and found me, at the second attempt, a nice hotel at a reasonable price, with breakfast included and the all important wi-fi. I took a walk up to the town square where I found families enjoying the evening. There were little electric cars for hire which a toddler could sit in while a parent directed it with a remote control. For older kids a parent could hire a tandem and take them for a ride around the square too. There was a nice fountain, a professional football ground for the local club and an Orthodox church. I could see this town had a high proportion of Russians in it. 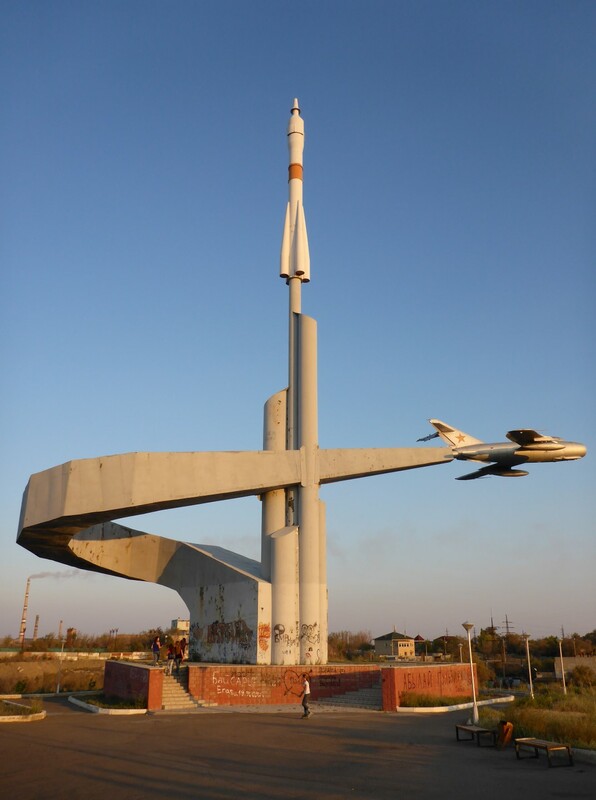 Near the square were some monuments, clearly from Soviet times, that included a MiG fighter jet and a missile. Soviet era, without a doubt. I find myself quite liking this Soviet art. Base Camp had sent all my documents to Diaz, my contact in Astana, Royal Mail having quoted a delivery time of 3-5 working days. Good news and all I had to do was hope they got there with no problems. My route since re-entering the country had taken me north and east, covering some old ground, but I had now turned north west and was heading for Astana. The rate of progress had varied according to what time I stopped, what time I left and the road conditions. Anything from 250 to 450kms per day. I had plenty of time left on my new visa. A recent change by the Kazakh immigration service meant that citizens from certain countries, including the UK, could obtain a fifteen day visa at the border. My original visa was a thirty day, single entry type so without this new facility I wouldn’t have been able to go to Kyrgyzstan, there being no route back to Russia except via Kazakhstan. 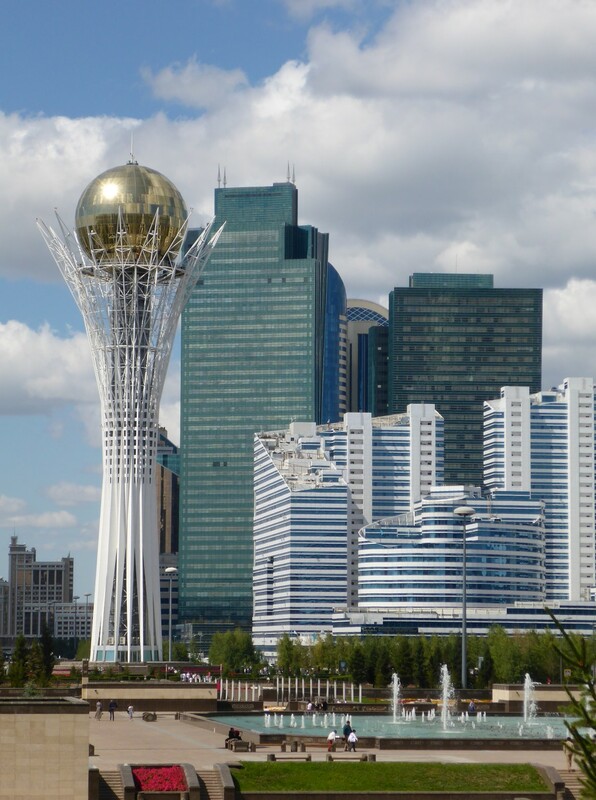 I was conscious now of the need to register with the immigration authorities so I was keen to get to Astana where I knew there was a big immigration office. With about 700kms still to cover I knew it would take a couple of days. I camped out again that night. I’d stopped at a café which advertised itself as being a hotel as well. Not any more. Something to do with lack of showers as far as I could tell. I didn’t care but the authorities did. It’s been said that the road to true love never runs smoothly and the same goes for the road to Astana. The asphalt surface was smooth enough, no problem there. This time the problem turned out to be a split in the rear tyre. It was pointed out to me by someone in a garage when I stopped for fuel. Fix it or forget it? I chose forget, hoping it would last at least until Astana where I could make a decision as to what to do about it. It goes without saying that about 20kms further on it went flat. So now there was no choice but to fix. I limped the bike up the road until I saw another garage where there was a nice, shady tree I could work under. No centre stand, no jack, so I laid Doris over on her side and set to replacing the tyre and tube. It was a bit of a struggle to break the bead but once that was done, all went smoothly. What the woman running the petrol station made of it all remains a mystery but I refuelled while I was there as a way of saying ‘Thanks’. 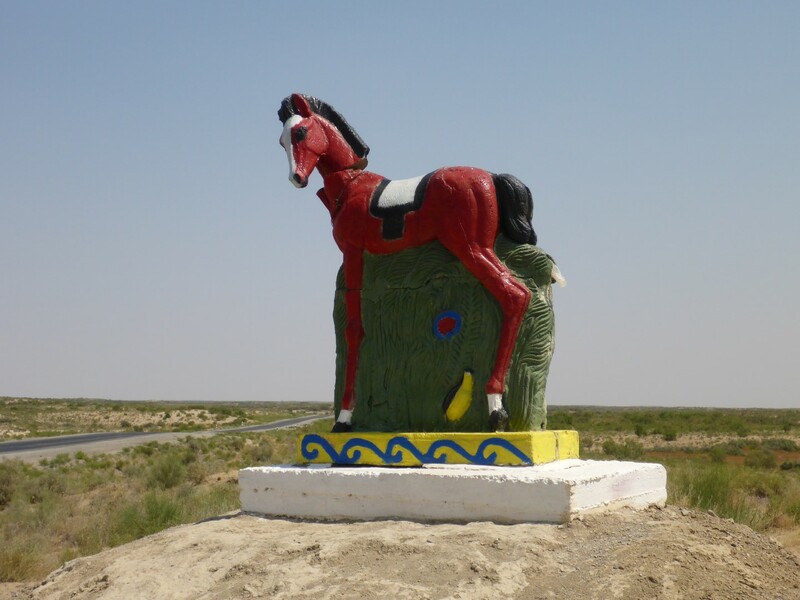 I had hoped the tyre that split would have lasted me until the planned fitting of both front and rear tyres ahead of going to Mongolia but the Kazakh road system, or my refusal to slow down sufficiently while riding it, finished the tyre off. In fairness it had lasted amazingly well. It was on the bike when I bought it, although it looked quite new. I’d covered over 3,000kms on it before leaving and had then ridden over 19,000kms. I had fitted a spare, part worn front tyre before I left and that was still in good condition. On the positive side, having removed the tyre from its storage place on the pannier frame and put it on the rear wheel, I was now carrying a bit less weight and had a bit more room. The downside was that I could now see that the pannier frame had broken and would need welding. Nothing to do but carry on and it wasn’t too long long before I was in Astana. A couple of phone calls resulted in one of Diaz’s friends coming to meet me on her bike and leading me to his apartment. Diaz wasn’t at home but I met Sappie, his girlfriend, who made me welcome with some food. Diaz came back after a while accompanied by a another young guy. As well as motorcycling, Diaz gets involved in mountain biking, snowboarding and writing and playing music. He and some friends are opening a shop which will sell mountain bikes, skateboards and snowboarding gear and he spends most evenings kitting it out ready for a big opening in a couple of weeks time. The young lad with him was a student from somewhere in the south of the country whose education he sponsors. Earlier in the year he, Sappie and some friends had completed a special forty five day Euro tour, with some government sponsorship, and had made a TV programme out of it. And to add to it all he’s a very nice guy too. He said I could stay at his place as long as I needed to but he only has a relatively small, one bedroom apartment and I knew that wasn’t going to be possible. The student sleeps in the living room and he got relegated to the kitchen floor when I arrived and stole the settee. Diaz’s main job is at the university where he works in the technical centre, although I’m not sure exactly what he does. But most importantly, the Tech department has a workshop and in that workshop there is a welder and a man who is very good at using it. 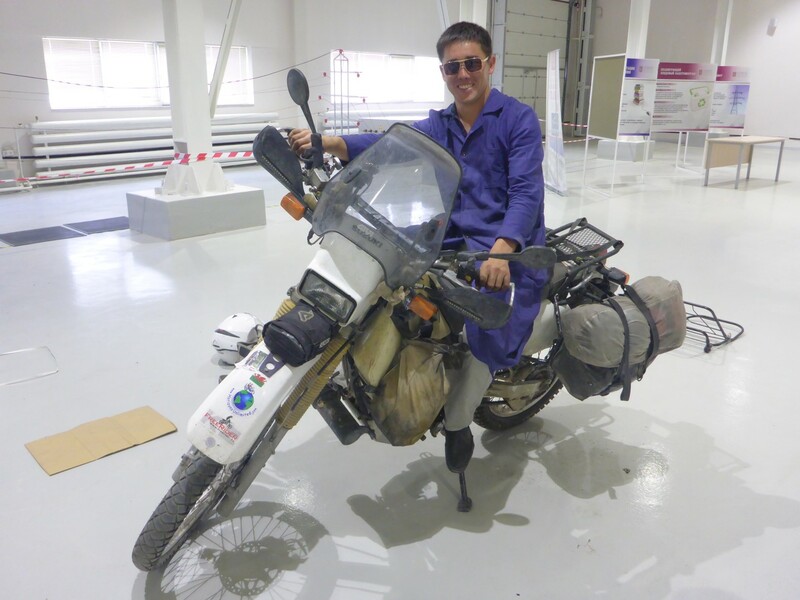 Diaz introduced me to Azamat who, once I’d removed the pannier frame, set to and welded it up. While he was at it he also welded up some small holes that had appeared in my silencer. Then he and Diaz decided part of the reason my pannier frame had broken was because it didn’t have a support across the back between the pannier frame on each side. So between them they found some suitable tubing and altered it to fit my bike. I got on with some other minor repairs, including making a better job of the repairs to the wiring that had got damaged on my way through Kazakhstan. A very productive morning indeed and I felt very humble when Azamat refused to take the money I offered him ‘Because you’re a traveller’. Wow! The least I could do was buy everyone lunch so we headed off to a café before Diaz led me to a hostel where I could stay while I waited for my important package to arrive. It turned out that Royal Mail’s estimate of 3-5 days was wildly optimistic. Diaz, and others, said they’d waited four weeks in the past for post from the UK. My euphoria dropped a little at that news. I only had just over a week left on my visa. The next task was to go to immigration and register. Diaz had kindly arranged for a friend to meet me there. This guy often sorted out registration issues for visitors as part of his job so he knew the system. Clutching my paperwork we headed into the heaving mass of humanity and queued up, at the wrong window it turned out. At the right window everything went wrong. It seems I was two days past the deadline so the woman there wouldn’t put the stamp I needed on my form. My interpreter/helper went off to speak to some people and after a while he came back and we went into the office of the uniformed chief. He said, in so many words, you’ve broken the rules, that will cost you $100 dollars in fines and when you come back for your interview you have to bring an official interpreter, likely to cost another $100. Then you’ll get your registration. Well that knocked me for six., that’s for sure. Diaz’s friend explained that I had to have an officially registered interpreter because when I was interviewed the interpreter would be legally responsible for the answers I gave because he was translating them. With plenty to think about I headed back to the hostel, mentally following the map that Diaz’s friend had shown me on his phone and hoping I would recognize the area when I got to it. Isn’t it strange how ups and downs can follow one another in such quick succession? Here’s a couple more. I got lost and despite knowing I was somewhere near the hostel, and asking a few people the way, I couldn’t find it. I stopped by an apartment block and was studying the useless little map the hostel had given me when a guy pulled up in his car and asked if he could help. I told him my problem and he invited me in for a coffee. I nearly said No but when Jas told me he owned the nearby coffee bar I changed my mind. The Praline Coffee bar was just across from where we were so I parked up and followed Jas inside. The coffee was followed by pizza then by tea while Jas and I chatted for over two hours. He was fascinated by my journey so far and my future plans and said I was crazy, which is why he likes me. Jas and his crazy friend. His story I found fascinating too. He’s from a small town in the south of Kazakhstan but went to university in Almati, which he said really widened his experience. His parents moved to Astana and he came with them, getting a job making Hookah pipes. He got fed up working for someone else and decided to open his own Hookah café. Now he has people making the pipes for him. Pipe smoking is very popular in Kazakhstan and his business is growing. He told me the water removes most of the nicotine from the tobacco then different flavours are added, such as fruit, to the smoker’s taste. His customers include the chief of the President’s security section, so he’s well connected too. He explained that doing business in Kazakhstan is all about who you know and how much you’re prepared to pay. I could understand exactly what he meant. He’s only 27 and is married, with a young daughter. A real success story. He was pretty sure he could help me with my registration problem too and I was very happy to take him up on that offer. He said he knew people in the right places and would see what he could do. He led me to the hostel, where I was happy to settle in and get to know the people I was sharing a room with. There were a couple of Polish students, Pawel and Kris, enjoying a Euro tour after completing their degrees, and a South African, Peter, from Cape Town, who had a position as a teacher here. The hostel was good, with great wi-fi, and it was good to have people to chat to. I stayed there the rest of the week waiting for my package and trying to resolve the registration problem. Jas did what he could. His contact only got me in to the office where I’d seen the Chief last time, with exactly the same result from the same person. Jas found me an interpreter after a couple of tries but in the end I cancelled the planned visit. As the week went by I’d been stewing on the situation and had decided to head for the border without registering. I’d managed to get through last time, eventually, and the worse that could happen was that they’d send me back to the nearest town to register, leaving me no worse off than I already was. I was fed up with playing their stupid, pointless, bureaucratic games. Probably the wrong attitude for a visitor to a foreign country but there really is no rhyme or reason to it except to make jobs for people. Registering to work or to extend a visa makes sense but doing so just to breathe their air doesn’t. So to hell with them. My visa expired on the Tuesday so my decision was to head for the border on Sunday, unless my package arrived earlier. This looked unlikely, based on the experiences of others and also that there was nothing on the tracking website except that it was somewhere ‘in transit’. Peter had contacted a lawyer friend who said to ring him if I didn’t get across the border and had to come back. He would act as interpreter for me if needed. That was good of him and gave me extra confidence in my back up plan. Peter told me some interesting things about the education system here. He’s an economics teacher and is employed to work in one of the regional ‘hot house’ schools that the government has set up for bright children. They are sponsored by the government throughout their school career, having been through a tough selection process. They stay away from home and will study six days a week and sometimes on Sundays too. A typical Asian approach, Peter said. He is waiting for the authorities who employ him to get their act together and move him from Astana to his new school near the Caspian sea. He has married a Russian woman and they hope to settle down together there. He told me some stories about the large gap between what’s promised in the contract and what gets delivered. I didn’t find myself very surprised. Baiterek Tower, modelled on a local legend about the Tree of Life, with some of the city’s great architecture in the background. I took a couple of walks in and around Astana, mostly to look at the amazing architecture. This city became the capital in 1997 and since ten has enjoyed a population, trade and building explosion. Much of the architecture is stunning, with some very interestingly designed skyscrapers, bridges, shopping malls and entertainment centres. There are a number of vanity projects connected to the president, but they look pretty good too. There’s always something interesting to look at and some of the more notable buildings make great landmarks too. I didn’t get lost any more. The buildings mirror the country’s ambition. 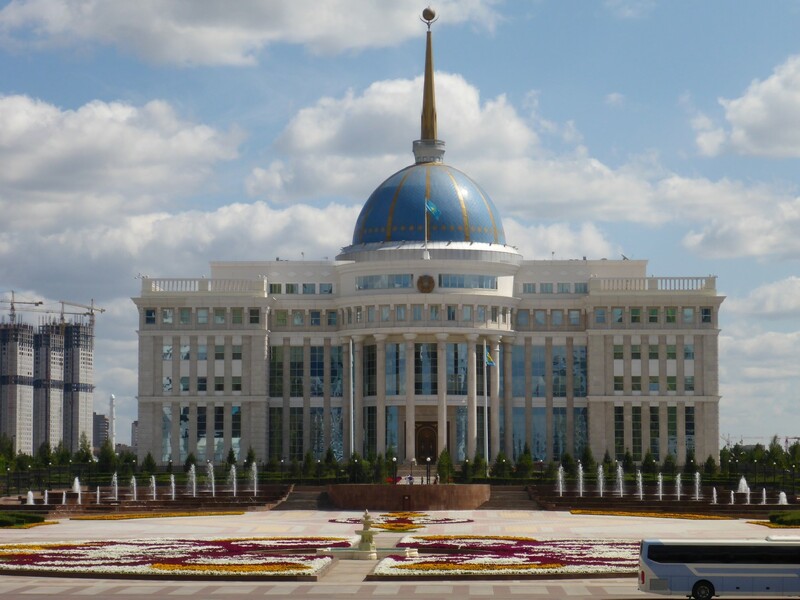 Presidential paalce, home to.Nursultan Nazarbayev. The apartment block the hostel is in reflects what I perceive to be a Kazakh obsession with security, mostly unnecessary in my opinion. Given how open, friendly and helpful everyone is, this approach seems rather over the top and, at times, very inconvenient. An example is the lift system in the block. Every resident has a tag which operates the lift. That tag relates to the floor their apartment is on and the lift will not go to any other floor. Likewise going down. The lift will only take you to the ground floor. So what does a resident do if they want to visit a friend who lives say, ten floors above them? Too far to use the stairs. I suppose they both have to meet on the ground floor and travel back up together. Crazy! The effect of this on hostel residents was that a member of staff had to come out and use their tag to make the lift go down when you wanted to leave and had to come down to the ground floor to meet you when you returned. That caused fun and games because there wasn’t always anyone available to do this. I was sometimes able to hitch a ride to a nearby floor and walk down or up to my floor. I met some nice people this way, albeit briefly. Part of the President’s Walk. 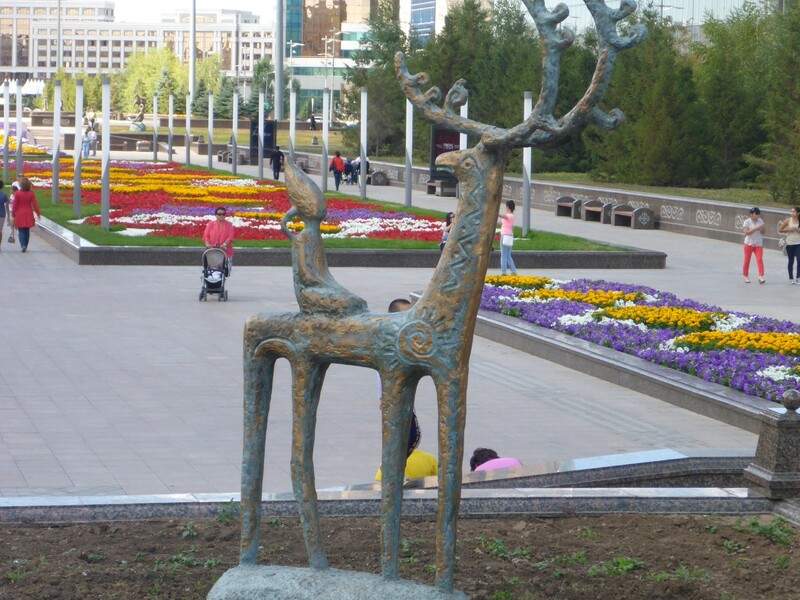 Quirky design is Astana’s hallmark. Something on a slightly more human scale. Sunday came round and I was heading out of town. I’d be back, one way or the other, and I was hoping it wouldn’t be to register. I’d told the young lad who managed the hostel that I’d be leaving at 9am, mostly to prepare him for being woken up to get me into the lift. I was heading for the Russian town of Omsk where I planned to await news of my package, at which point I’d head back to collect it. I’d discussed routes with Diaz and he had told me the best one to take, based on the best roads, very important in Kazakhstan. There was a shorter cross country route but Diaz said the road wasn’t too good. OK then, longer but quicker was the decision. Nearly 800kms but I expected to do it in one day. I’d identified, but not booked, a hostel in Omsk that I was going to head to. 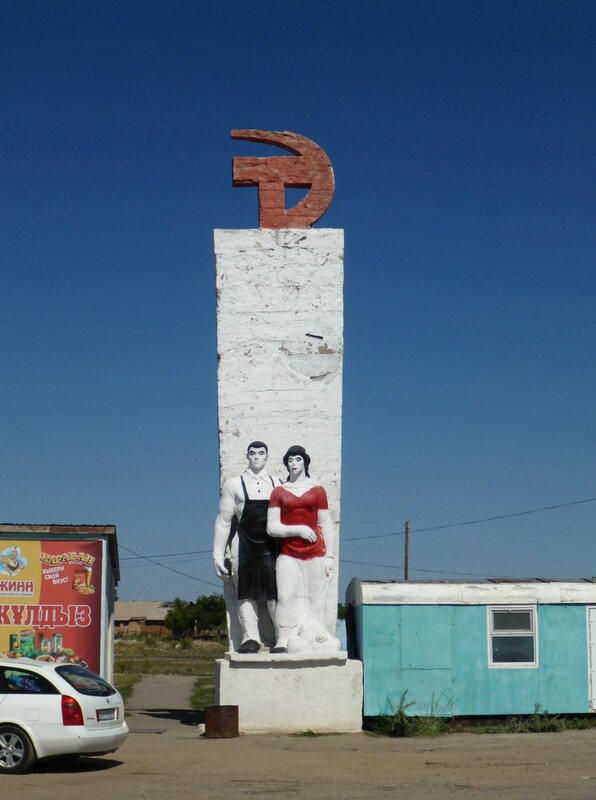 The first major town on the route was Kokshetaw, then Petropavlovsk and finally the Russian city of Omsk, with the border being 150kms before it. I set off at 9am and got out of Astana easily using the route I’d worked out from Google maps. I took care with my speed as there were police ready to pull vehicles in at every junction. Good dual carriageway all the way and as I approached Kokshetaw I saw a sign off to the right for Omsk. I knew this would form a nice diagonal across the square my original route formed and I took it. Whether or not it was the route I had seen on the map that Diaz said to avoid, I don’t know. But the road was asphalt all the way except for the last 20kms, and had been mostly good. It was a small border crossing with just a few cars waiting so I went up to the first gate and offered my passport to the guard there. He examined it and said something to me. I didn’t know what he meant and he got on the phone. Someone else came across and explained to me that this crossing was for Kazakhs and Russians only. On a previous occasion I metaphorically got down and kissed the ground. This time I metaphorically got down and beat my head on it. He explained that I would have to go back to Kokshetaw to regain the road to the correct border crossing. I could see from my map there was no choice. 600kms, two tanks of fuel and eight hours wasted. It was now 6pm, it was starting to rain. I got back on the bike and rode away. Eventually I got back to the main road at Koketshaw and considered finding a hotel as it was now dark. There’s an unwritten rule that you don’t ride a bike in the dark in countries whose infrastructure is to less than European standards. Too many risks from the road, drivers and animals. I think Kazakhstan fits into that category. I ignored the rule and rode. I needed to get to that border to see whether I could get across. I knew I couldn’t rest until that situation had been resolved. A very strange building whose function is a complete mystery to me. Kazakh roads are mostly straight and they do have quite good warning signage, even if the direction signs aren’t what they could be. So I headed up the dual carriageway, which then became single carriageway, but still good. Too good to last of course as the inevitable roadworks loomed. Down the embankment and into the dust and ruts. Riding off road is good fun. Riding off road by headlight is not to be recommended but it had to be done. 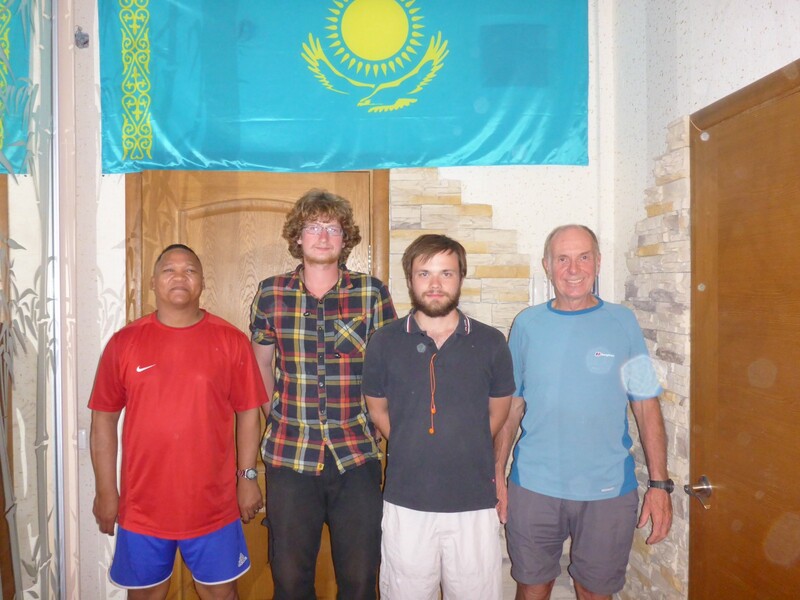 Fear makes you careful and I got through it in the end and made it to Petropavlovsk. A stop for fuel and to buy a couple of Snickers, then follow the signs to Omsk, the border now only 100kms away. I had a bit of a nodding off period, but managed to get through it without mishap. After that all was well and the border hove into view at 03.30. Whether or not it would have been different if I’d arrived ten hours earlier I’ll never know, but passport control didn’t even mention the registration document and I was through in ten minutes. A Kazakh who was passing through from Russia asked me what I thought of the country and I told him about how much I loved the people. The border guard had come out to chat with us so I thought it best not to mention how much I hated the bureaucracy. I wasn’t through the exit gate yet! Twenty minutes later I was officially in Russia. It was just as dark and I got back on Doris to set off into the night, 100kms to go to Omsk. It got light around 7am and I found a bus shelter where I could put the bike out of sight behind it. I ate another Snickers, lay down on the bench and slept for an hour and a half. It wasn’t until two days later that I discovered I’d been thoroughly nourished on by midges while I dozed. I took a slow ride into the city, found Hostel Millenium after a bit of a search, and was delighted that they had a bed for me, and at a very reasonable price. I’d covered over 1450kms in 24 hours and couldn’t have ridden another kilometre or walked another step. I’d eaten Snickers but I’d completed a Marathon.